The Sun Joe HJ604C Cordless Hedge Trimmer is the best small hedge trimmer you can get for the value it provides. Your joints ache and you don’t have the strength you used to. But you love taking care of your garden and keeping it beautiful. And you want to trim the hedges, shrubs, and bushes to keep it so. Hedge trimmers can be intimidating for an elder person. You may find it difficult to hold the hedge trimmer for a long period of time because it’s heavy. A small hedge trimmer will help you do the small trimming work in the garden without worrying about your age. So let’s take a look at the best small hedge trimmer for your garden needs. What is a small hedge trimmer? Do you need a small hedge trimmer? A hedge trimmer is a tool that can help you trim hedges, shrubs, and bushes in the garden to make them look aesthetic. You can get hedge trimmers that are gas-powered, battery-powered, or electric. A small hedge trimmer is a low-power variant that is very lightweight and easy to use for small trimming work in the garden. This makes them quite powerful to use for commercial purposes where you need to trim lots of hedges in a yard or garden. They tend to be heavy because of the fuel tank and cause pollution due to the exhaust. They are also noisy when compared to electric hedge trimmers. When you need a small hedge trimmer you don’t need the power that a gas hedge trimmer provides. They tend to create less noise and pollution than a gas hedge trimmer. They also are inexpensive and easy to maintain. You can find a small hedge trimmer that could be corded but the drawback is its mobility is limited to the length of the extension cord. This makes it quite portable and free from pollution. They are easy to maintain when compared to a gas hedge trimmer. You can find several small hedge trimmers that are cordless and suitable for your garden trimming needs. A hedge trimmer can save you a lot of time and effort trimming shrubs, bushes, and hedges in the garden. And if you are old or just can’t handle heavy tools, a small hedge trimmer can help you get done with those small trimming jobs with ease. Many small hedge trimmers run on electricity and could be corded or cordless. You can opt for a cordless variant because they are inexpensive, lightweight, and very portable. There are some factors that you should consider before making your buying decision about a small hedge trimmer. The most important factor for choosing a small hedge trimmer is the weight of the tool. The good thing about small hedge trimmers is they tend to be quite lightweight. So you can’t go wrong when choosing one. A weight between 2 to 4 pounds should be comfortable enough to carry for a long period of time in the garden. A small hedge trimmer will be an electric one but you need to choose between corded or cordless. A corded hedge trimmer is lightweight and inexpensive but it is limited in mobility by the length of the outdoor extension cord you use. A cordless hedge trimmer runs on battery power so it is quite portable but tends to be a little bit more expensive than a corded one. The power of the small hedge trimmer is measured in Amps or Volts depending on whether it is a corded or cordless one. They tend to have quite low power but that’s more than sufficient to meet your small trimming needs in the garden. If you can get one with an ergonomic handle that would be good because that makes it easy to control the hedge trimmer. The length of the bar of the small hedge trimmer will be around 6 inches that is sufficient for the small trimming work. The blade is made from hardened steel that makes the hedge trimmer durable and easy to use for trimming. They may even be designed to reduce the vibrations in your hand while using the trimmer. The cutting capacity is not as important to consider for a small hedge trimmer because they are meant for small trimming work on ornamental shrubs, bushes, and hedges. It’s always the best to choose a small hedge trimmer that is very durable so it works great and lasts a long time. You might have to spend a bit more money but it’s worth the quality you get in exchange. Make sure that the blade is made of high-quality steel and the build is of good quality that does not wear out easily. The longer the warranty on the small hedge trimmer, the more assured you are of getting service in case something goes wrong during the warranty period. So choose a small hedge trimmer that comes with a good enough warranty. A small hedge trimmer typically tends to be inexpensive compared to the bigger variants available. It’s good to buy a small hedge trimmer with the best quality even if it costs a bit more than the average ones. Because it will last longer, give you good performance, and need less maintenance. If you’re on a budget and don’t want to spend a lot on such a small hedge trimmer, you can choose a budget small hedge trimmer that gives good enough quality while being lightweight and useful. A small hedge trimmer might be small but you do need to be careful when using so you avoid injury. Ensure that the work area is clear from debris so you don’t risk falling and injuring yourself. Make sure there are no children or pets in the area before you start trimming. You should wear protective equipment before starting to trim. This could include a pair of gloves and safety goggles so the chips don’t fly into your eyes. If you’re using a corded hedge trimmer, make sure you have a sufficiently long outdoor extension cord. If it’s a cordless type, make sure the battery is fully charged before starting the trimming of hedges. You can start the hedge trimmer and trim from the bottom to the top of the hedge. Make sure to keep the top of the hedge a bit narrow than the bottom so that light can reach the lower foliage. This will encourage overall leaf growth on the hedge making it look good. You can practice using the hedge trimmer in the garden. This will get you used to how the small hedge trimmer handles and the vibrations on your hand. To trim the top of the hedge, keep the blade parallel to the top and move it from left to right trimming the growth. To trim the sides of the hedge, keep the blade parallel to the side and move it in a bottom to top motion and trim the growth. A small hedge trimmer is usually electric which means it does not need a lot of maintenance as a gas-powered hedge trimmer would need. You do need to keep the blade in good shape so it remains sharp and durable for a long time. Before and after using the small hedge trimmer, make sure to clean the blade so it’s free from debris. Once you’re done with the trimming and maintenance work, place the small hedge trimmer in a safe place away from children and pets. The Sun Joe HJ604C is a cordless hedge trimmer that comes with a 7.2V Lithium-Ion battery. It’s a 2-in-1 tool because you can use it as a hedge trimmer or a garden shear based on the attachment you use. The 6-inch hedge trimmer blade is made of durable steel so it gives you good performance and lasts a long time. The handle is ergonomically designed so you feel comfortable when using the hedge trimmer giving you good control while trimming. It comes with a safety switch that protects you from accidental starts. This small hedge trimmer is suitable for small trimming jobs because of it’s average cutting power. 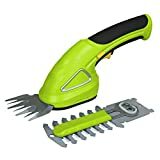 This small hedge trimmer weighs just 2.5 pounds which makes it quite lightweight and easy to use for a long period of trimming in the garden. The Sun Joe HJ604C comes with a full two-year warranty in case of some manufacturing defects you find in the hedge trimmer. The Black+Decker GSL35 is a cordless hedge trimmer that comes with a 3.6V Lithium-Ion battery. This is a 2-in-1 tool that can trim hedges or shear grass based on the attachment you use. 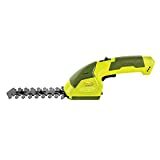 The 6-inch blade is made from precision-sharpened steel that is durable and lasts a long time trimming hedges, shrubs, and bushes in the garden. The hedge trimmer is built with an ergonomic design that gives you good control and comfort while trimming the hedges. You may find that the safety trigger you need to depress to use the actual trigger is too far away and inconvenient to use. The weight of the Black+Decker GSL35 is just 1.7 pounds which makes it very lightweight. This is useful for people with arthritis or those who can’t lift heavy weight for a long period of time. This small hedge trimmer comes with a limited two-year warranty on the tool in case of manufacturing defects. The SereneLife PSLHTM20 cordless hedge trimmer comes with a 3.6V Lithium-Ion battery sufficient for small hedge trimming work in the garden. The battery does need about 4 hours to fully charge. This is a 2-in-1 tool that can be used as a hedge trimmer as well as a grass shear based on the attachment blade you use. The handle has an ergonomic design and comes with the easy to use ‘glide-cut’ technology that makes it comfortable and easy to use. You need to hold down on the safety trigger so you can use the actual trigger which is a bit inconvenient. This hedge trimmer is made of heavy-duty engineered ABS construction which makes it very durable for heavy outdoor use. 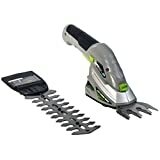 The SereneLife PSLHTM20 small hedge trimmer weighs about 2.25 pounds which makes it lightweight and convenient to use in the garden for a long time. This small hedge trimmer comes with a limited one-year warranty against manufacturing defects. The Earthwise LSS10163 cordless hedge trimmer comes with a 3.6V Lithium-Ion battery and charging unit. This is good enough for small trimming jobs in the garden. The 6.3-inch blade is made from durable steel that will last a long time before it needs to be sharpened. It can trim branches up to 5/16 inch thick. This small hedge trimmer is a 2-in-1 tool. It comes with molded mounting plates that make it easy to switch the blade from the hedge trimmer to garden shear. The Earthwise LSS10163 hedge trimmer weighs about 2.45 pounds which makes it lightweight to carry around in the garden for a long period of time without fatigue. This small hedge trimmer is quite inexpensive and suitable if you’re looking for a small trimmer on a low budget. You may find that it’s not easy to get a replacement battery for this hedge trimmer. This small hedge trimmer comes with a limited one-year warranty on the tool against manufacturing defects. 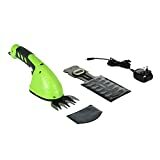 The Greenworks SH07B00 cordless hedge trimmer comes with a 7.2V Lithium-Ion battery that gives good power for small trimming work in the garden. This is a 2-in-1 trimmer that can be used as a hedge trimmer or a garden shear based on the attachment you use. The 6-inch hedge trimmer blade is made from durable steel that will not need sharpening for a long time. You may find that the cutting teeth are a bit shallow and get stuck. The handle of this hedge trimmer has an ergonomic design that gives you maximum comfort when you’re using it. This hedge trimmer weighs just 1.2 pounds making it very lightweight and easy to carry around in the garden for a long period of time without fatigue. The Greenworks SH07B00 comes with a full four-year warranty which is double what some of the other manufacturers provide. You don’t need to worry anymore. It does not matter if you are old. Or if your hands are weak. With the help of a small hedge trimmer, you can keep your garden looking at its best. The best small hedge trimmer you can get is the Sun Joe HJ604C Cordless Hedge Trimmer. It gives great performance, durability, and comes at a good price. If you’re limited in budget and looking for an inexpensive option, you should consider the Greenworks SH07B00 Cordless Hedge Trimmer. 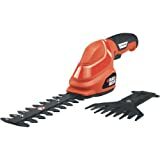 This hedge trimmer is lightweight, easy to use, and inexpensive but gives a good trimming performance.